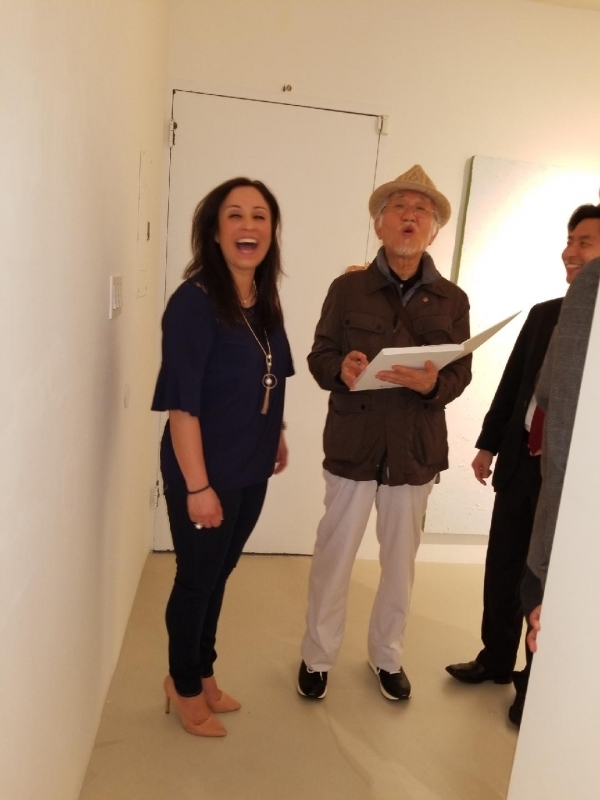 I had the good fortune be invited by Jennifer Baahng to visit the Baahng Gallery on Manhattan’s Upper East Side neighborhood during the Madison Avenue Gallery Walk to view the exhibit Halo: 1980-2018 and meet with the artist, Kim Hyung-Dae. 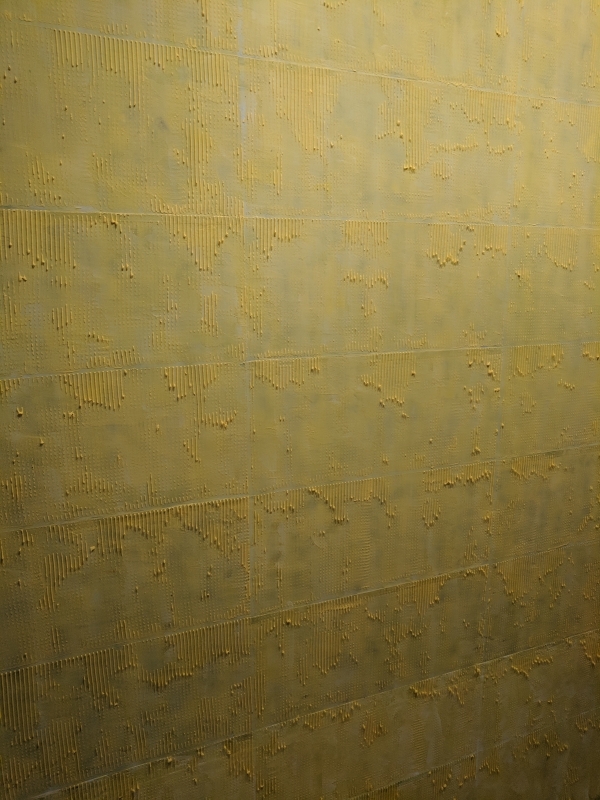 Kim is a renowned and highly acclaimed artist of the Korean Contemporary style, a master skilled in both woodcut prints and a unique style of abstract painting with textures. In his childhood, Kim spent much of his time exploring and enjoying the abundant natural beauty of Korea, the natural forests and pristine rivers in which he played. His childhood was also cut short by the military conflict which later became known as the Korean war, and resources including food and clothing were often in short supply in his village. These influences can be seen in Kim’s art, which at times embody sadness and pain, but at others an enduring sense of hope and positivity. Throughout all his work, the connection to nature and its influence on the artist is evident. Early in his career, Kim primarily worked with oil on canvas as his medium. Some of these paintings carry deep browns, grays and reds and take on the look and feel of weathered wood siding from a old farmhouse. Others in blues, whites and yellows reflect Kim’s experience with wood cut prints, and make use of shapes that seem to rise from the cellular structure of organisms being examined under a microscope, as if the artist had scraped the bottom of a tree leaf or a river stone and placed in on a slide to view with magnification. 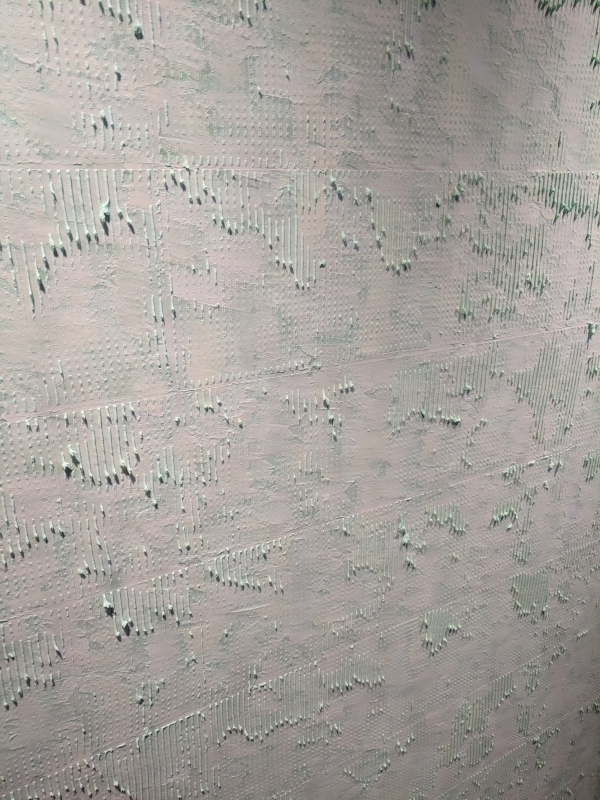 Kim wasn’t fond of working with oil, as he felt that it limited his ability to capture textures in a way that would allow him to reflect light and shadows the way he envisioned them for his pieces. 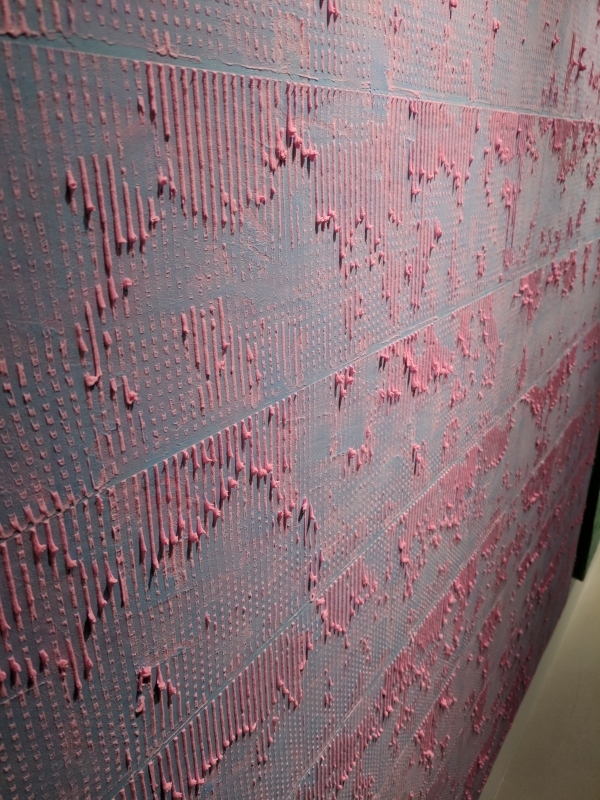 He transitioned to painting with acrylic on canvas, and also began using a proprietary textural compound that is derived from mother of pearl, an element he favored due to its high luminescence and light weight relevant to common plasters. In the works from his Halo collection on display, it clear that the technique employed by Kim is the one he was meant to create. Kim’s recent paintings possess a ethereal quality to them, which creates a sense of timelessness. The viewer can see the translucent outline of a serpentine river which has over decades carved its path through a terrain changed permanently, yet constantly changing. One can see the blue sky dancing above the clouds and promising hope and eternal optimism. There is a rhythm to the raised structures which can appear to some as a beautifully written musical score, a computer screen relaying stock data in real time, or the continuing fibrillation and pulsing of the human heart at it beats in harmony with the world around it. 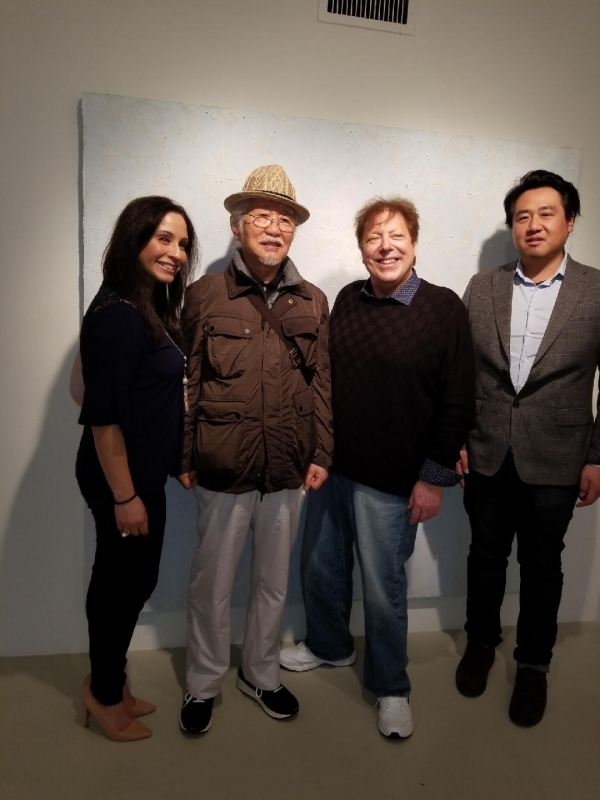 See Halo: 1980-2018 exhibit by Kim Hyung Dae on display at Baahng Gallery, 790 Madison Avenue, New York, NY now through May 20th.